Bellwether 5 ft. Rectangle Right Drain Bathtub with Integral Farmhouse Apron in White An update of a bestseller, Bellwether features a clean, contemporary design in a popular, industry-standard size. Its integral apron simplifies alcove installation, while a low step-over threshold allows for comfortable entry and exit. Bellwether's wide ledges provide storage space for towels, toiletries, and other items. Crafted from enamelled cast iron, this bath offers years of reliable performance. 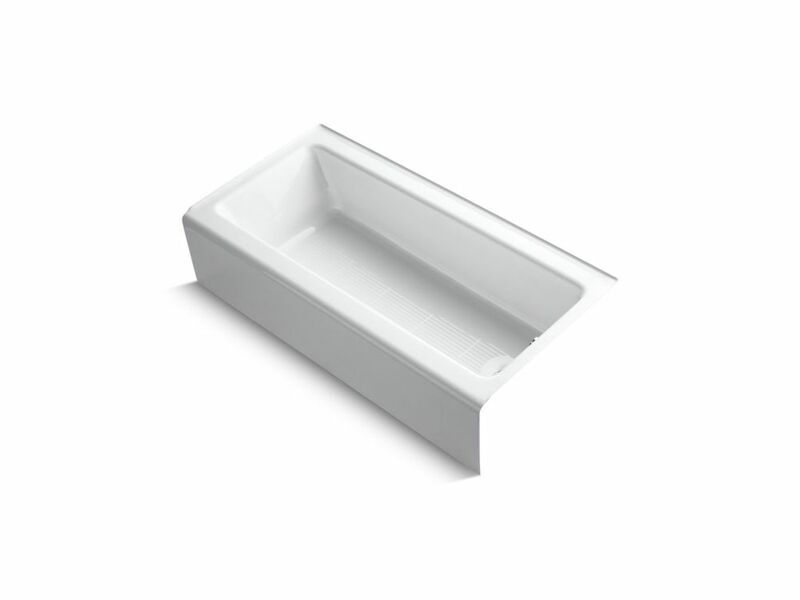 Bellwether 5 ft. Rectangle Right Drain Bathtub with Integral Farmhouse Apron in White is rated 3.9 out of 5 by 50. Rated 3 out of 5 by Norma411 from Very heavy making it much more difficult to install. Narrow too, A larger person would be hard p... Very heavy making it much more difficult to install. Narrow too, A larger person would be hard pressed to fit comfortably in this tub. Low soaking depth, I turned the overflow upside down which helped. I do like the finish and not skid bottom as well as clean ability which is why I chose cast iron over fiberglass/acrylic. Rated 5 out of 5 by JessP from Can't go wrong with a cast iron tub. This Kohler tube is great, love the extra space on edges. Can't go wrong with a cast iron tub. This Kohler tube is great, love the extra space on edges. Rated 2 out of 5 by Dissatisfied from We also experienced a rippled or hammered look on all over the entire glaze, inside and out ( The... We also experienced a rippled or hammered look on all over the entire glaze, inside and out ( The glaze was applied to thick?). The picture does not do it justice… Hard to photograph. I took a 10 second video that clearly shows how bad it is but it would not upload. You can really feel it with your hand when you rub the surface We returned it and I’m going to buy a non-Kohler product that we can see in the store that we don’t have to order. Very disappointed. Rated 5 out of 5 by CrowdSurfingGeezer from This is a beautiful tub. I was impressed by the quality and the thickness of the porcelain and th... This is a beautiful tub. I was impressed by the quality and the thickness of the porcelain and the precision of the cast iron casting. I really like Kohler products. Rated 1 out of 5 by Timothy from Waited two weeks for tub. Tub arrived damaged. Sure it’s... Waited two weeks for tub. Tub arrived damaged. Sure it’s a great tub, but have to find another use for this one! Rated 5 out of 5 by Janet from It looks great. A good fit with my style.... It looks great. A good fit with my style. Rated 5 out of 5 by Tim from This is a solid, sturdy tub. They're very common in hotels and for good reasons: easy to clean, a... This is a solid, sturdy tub. They're very common in hotels and for good reasons: easy to clean, anti-slip, easy in, no frills. It's not a soaking tub for a luxury master bathroom, but it's perfect for the common bathroom. It's very heavy, but you can feel how sturdy it is under your feet compared to an acrylic tub. I expect it to last forever. When the acrylic tub goes in another bathroom, I expect I'll replace it with one of these.